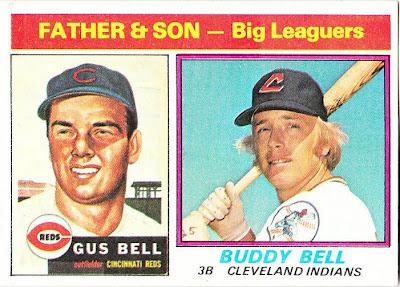 Starting in 1976 and returning in 1985, Topps honored father and son duos with subsets picturing both dads on older sets and sons as current players. Night Owl did a nice breakdown of them back in 2010, which you can revisit now. Dad and I played catch quite a few times and pretty sure he helped ferry me to and from Little League games across the five years I spent on those mini-diamonds. Thanks, dad! Can't remember any bleacher fights from my own years in a kid-sized Cubs jersey, but I understand that people get a little rowdier these days. I recently finished Hayhurst's pair of baseball memoirs, The Bullpen Gospels and Out Of My League, available at Amazon and finer public libraries across the country. He paints a harrowing family picture that pitching helped him escape and reshape. They're worth a read for both baseball insight and Dirk's longer-term introspection. I wish we'd had another round of Father and Son cards in the 90s, at least to see these guys. 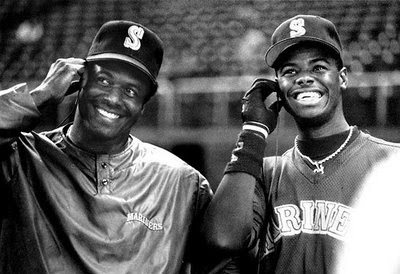 The back-to-back homers Griffey Sr/Jr hit on Sept 14, 1990 remain the only ones hit by a father-son duo and the Seattle Times put them first on their list of Junior's 10 most memorable long balls. 1989 Bowman actually has a Father/son Griffey card. Also has a Ripken family card. Too bad they are oversized. the twins had a segment on their pregame show sunday about fathers/sons, and they doctored up a 1985 topps f/s card for the buteras (sal and drew) to go along with the real card topps made for the smalleys (roy was calling the game on tv in place of bert blyleven).